I thought today would be the perfect day for me to share some of our favourites from our tour of Christmas Markets in Germany. For a few days, we lived and breathed everything Christmastime has to offer in Bavaria – mulled wine, lebkuchen, and of course, the daily diet of bratwursts and sauerkraut. I think I must’ve been German in my past life; these people definitely do food that tickles my fancy! We began in Stuttgart, where we used AirBnB to book our stay with a lovely couple. The lady of the house directed us to a local “fast-food-like” joint with some instructions to try “maultaschens” for lunch. Maultaschens are like giant German raviolis, and the instant the savoury raviolis arrived with a pile of sauerkraut next to them, I knew I was going to love the dish. We got along just fine. We walked through the main market a bit, had our first of many glasses of gluhwein, or mulled wine, and realized the magic of these markets: they never end. Just when you thought the row of stalls was coming to an end, a new branch/alley would open up full of hustle and bustle. It was overwhelmingly exciting. Eventually, we tore ourselves away and proceeded to check out the Mercedes-Benz Museum. 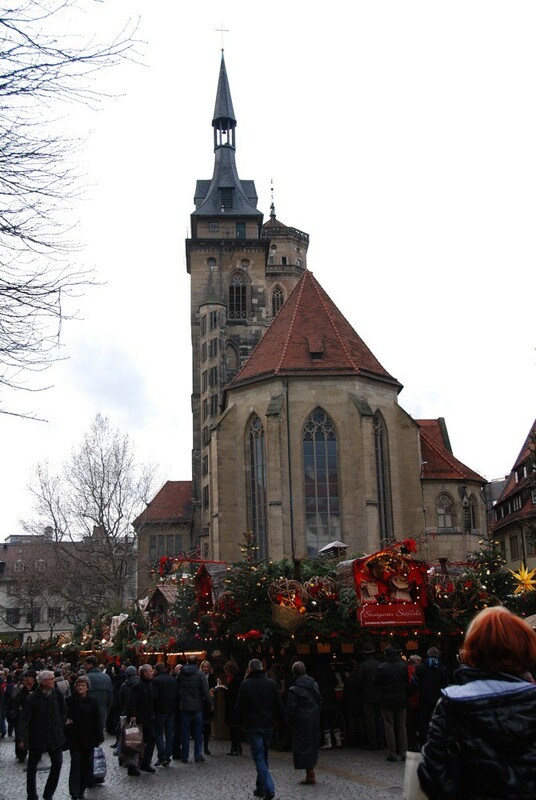 From there, our host lady had recommended the Christmas Market in Esslingen, just outside of the city. We arrived in Esslingen at night and were immediately blown away. The Esslingen Market was set in the midst of an ancient (Medieval, in fact) town square. Flanked by seriously old architecture that I’ve only seen re-constructed in movies, the market vendors were all dressed up in costume, and the organizers even took great care to ensure the signage etc. were all written in Medieval manuscript fonts. A flame thrower and a tightrope walker completed the feel of a Medieval “faire”. It just felt like some of these people had been there for generations, doing the same thing, doling out dishes of jolly Christmas spirit with a side of potatoes. 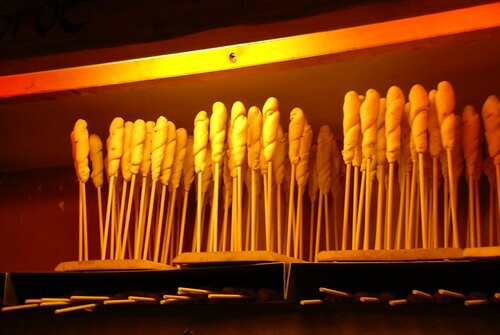 A highlight was the bread-on-a-stick. No less than three German families stopped us in our tracks to ask us where to get these for their children. Most of the time we were confused as these parents barrelled on in German, but eventually the eager pointing/stabbing with finger motion at the bread clued us in. We ate very well at the Esslingen Market. My favourites were the apple slice fritters sprinkled with zimtzucker, which we quickly learned was cinnamon sugar, and the tray of roasted herby potatoes with a generous dollop of creme fraiche. 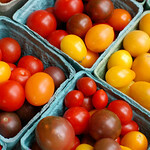 By then, we had also learned our ways around the “staple foods” of the markets, too. 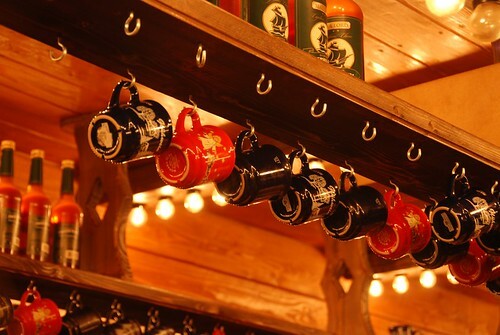 Mulled wines always had a deposit and arrived in a customized mug for the market/stall. A small cone of sugared nuts – usually almonds or hazelnuts for us – was a must-have as we wandered from stall to stall inspecting the crafts and decorations. 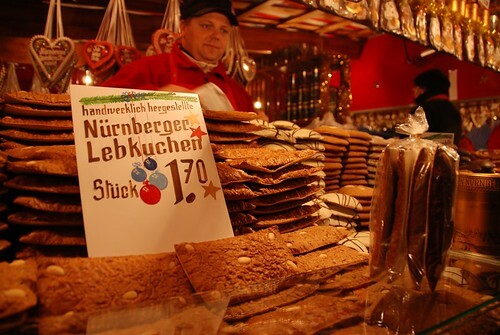 Since the Germans actually believe in gingerbread (compared to the French and their pain d’épices), we would pick up a piece or two of lebkuchen mit honig (with honey!) before the night was over. Good things my jeans were a bit loose before the trip began! 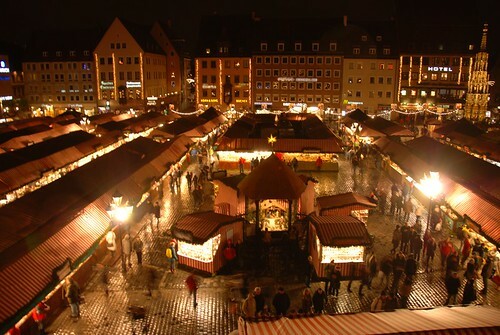 From Stuttgart we moved on to Nuremberg, one of the oldest and more traditional markets in Bavaria. 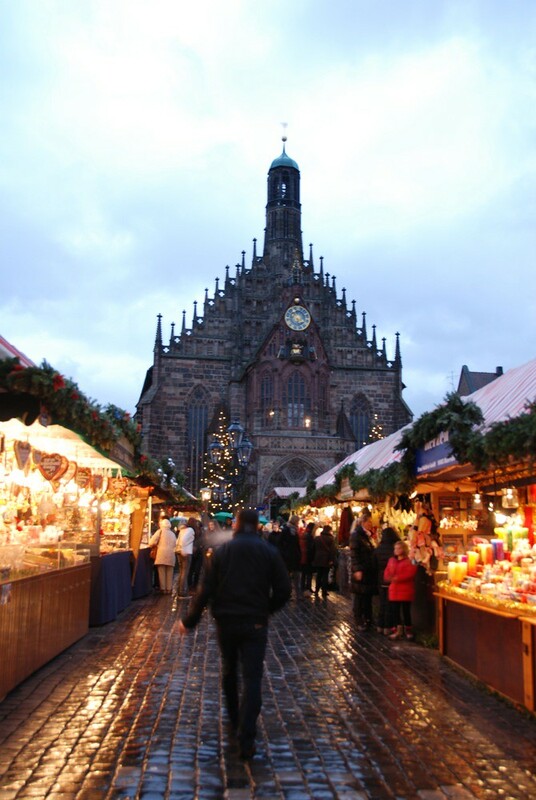 In Nuremberg, the market is large and organized by rows and rows of impressive stalls, mostly in the town square. 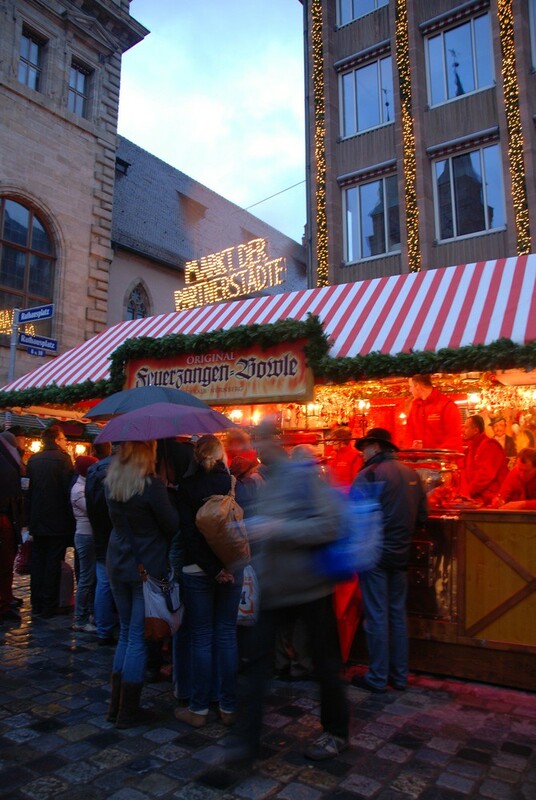 However, the whole city comes alive with Christmas spirit in celebration of the famous market. The walk from the station into the main market is studded with stalls as well. 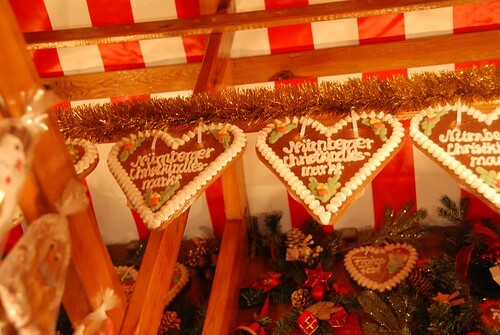 There were fruit and veggie sellers, gingerbread stands, pretzel stands, etc. We learned there that Nuremberg sausages are small and usually an order meant three of them on a round baguette. We tried a few other dishes around here, including a stall that sold hearty bowls of chicken stew with a heavy dose of curried tomato sauce. 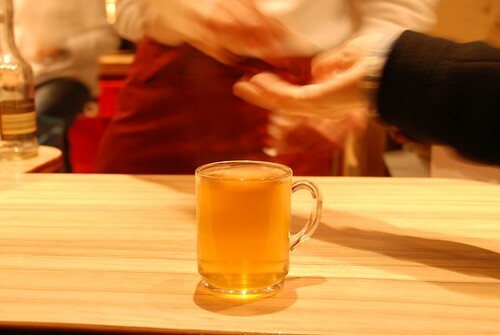 Customers crowded around the stall to use the little ledges as a makeshift bar to indulge. It was a cozy setup to be close to the bubbling trays of stew on a cold winter’s night. 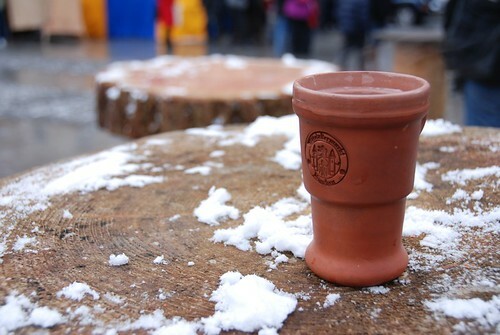 It was also in Nuremberg we discovered the feuerzangenbowle – mulled wine with a giant sugar cone set on fire. The sugar cone is soaked in rum and held over the cauldron of mulled wine with a contraption…then set on fire. As it burns, the sugar drips into the wine along with a bit of rum I suppose. It was a strong wine that warmed me to my toes! We finished our trip in Munich. We browsed all of the markets in the city and ate our fair share of sausages and sauerkraut, and drank more than enough mulled wine. We also spent some time doing a history walking tour of the city, which was really fun. The history tour was really cool because even though we had been to Munich before, it was only for a layover and we never learned much about the city itself. After this walk, I’m much more appreciative of the city…and I definitely want to go back to Munich for Oktoberfest one day! It should also be noted that it started absolutely blizzard-ing when we were walking from market to market in Munich…so pictures are few and far in between. For two Canadians, we were embarrassingly unprepared for snow, and spent most of our time in Munich shivering and blowing hot air onto our pink cold hands. It’s surprising how much we’d forgotten about winter weather in such short months. My favourite market in Munich was the small Medieval one by the Odeoplatz. 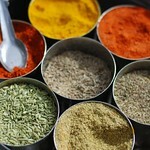 It was quite expensive compared to the other markets we’d been, but the food was different and delicious. 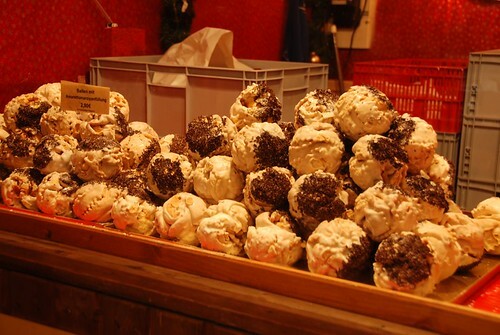 In general, the Medieval markets featured more variety of “German grub” outside of the standard bratwursts-and-bread or bratwursts-and-sauerkraut combination. We had a steaming hot bowl of stew with turkey and potatoes (with a mound of creme fraiche on top, of course) in the blizzard there. Of course, good wine was to be found there too. Fancy terracotta mug – heavy deposit! Some other highlights from the Munich markets were the potato slices fritters: like potato chips, but greasier and much more delish. Alex pronounced it “dirty”, but I slurped it all down with glee. I also figured out what a splitterballe was…a super soft homemade marshmallow with a thin coat of chocolate. It was amazing! At our AirBnB host’s urge, we also went to see Tollwood market, which is where Oktoberfest is held annually. It was more like a night market that happens around Christmas time, but with heated tents who was I to complain? We ended our trip with a personal sized firebowl mulled wine and shupfnudeln (spaetzle noodles and sauerkraut stir-fried together, sometimes with bacon bits too). Mmmmmmmm. Merry Christmas everyone! I hope you’re enjoying the holidays with some of your favourite people, wherever you are. 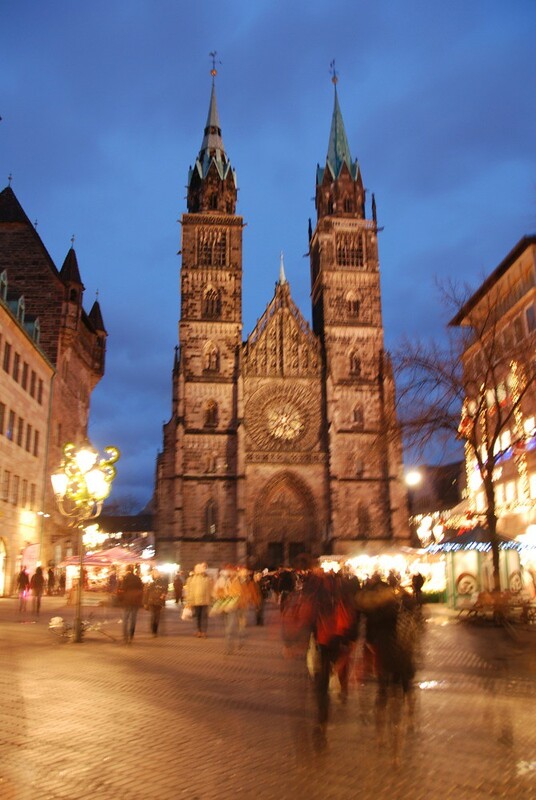 Nuremberg – a bit blurry, but it was too cold to expose my hands for multiple photos! 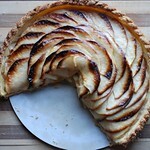 I think my favourite bit was when we asked to try a “pfand”. After a confusing few minutes with the stall keeper, we learned that “pfand” means deposit. Triste.